Not having your equipment attached to your body at all times could cost you when a big buck walks into range. These simple mistakes can easily be avoided. Have you ever lost sleep over a tall-tined monster you had dead-to-rights moments before he hightailed out of your life? Brother, I have. Although we want to pout, the only constructive thing we can do is learn from our mistake so it doesn't happen again. Here are several big-time blunders that saved a big buck — and could save you from future heartache. Brad Gaddis caught a giant whitetail on a trailcam that he thought could challenge the Oklahoma state record. So on a cold and rainy afternoon, Gaddis put on his new, high-dollar raincoat over an extra layer and clambered into his stand. But when he removed his binocular from his backpack, he discovered its harness was too tight to wear around his chest. So he sat the bino in his lap. An hour later the 16-point buck presented an easy 20-yard shot. But when Gaddis stood to draw, the binocular fell from his lap and clanked like a brick. The once-in-a-lifetime behemoth bolted before the binocular hit the ground. The Lesson: Practice in all the gear you might wear hunting to avoid mishaps at the moment of truth. Murphy's Law works overtime when the pressure is on. So immediately after getting situated in your stand, perform a systems test. Draw your bow, make sure your treestand doesn't squeak, check that your sleeve isn't in the way of the string, etc. Do this before you see the big buck of your dreams&apos;¦or else it may live eternally in your nightmares. Despite using a bipod, the Thompson/Center's barrel quivered like a mesquite tree in the South Texas wind. Larry Weishuhn was in the midst of a bout of buck fever, and he knew it. Sure, the whitetail before him was the king of all 6-points, but it was still a 6-point. He'd taken hundreds of bigger deer. Maybe it was the anticipation formed by talking about this very cull buck over the last several years. Whatever&apos;¦. Larry fired only to see a puff of dust strike halfway between him and the now-startled deer. It remains one of the worst shots "Mr. Whitetail" has made in 50 years of hunting. The Lesson: "If you're stricken with buck fever," said Larry, "take a deep breath and focus on a specific spot on the animal's vital zone, not the animal as a whole. And if you can't get it together, don't shoot until you can." Of course, this sounds simple&apos;¦until adrenaline seizes your ability to think clearly. That's why many veteran bowhunters place a sticker with the words "Pick a Spot" on their bow's limb. Larry should have placed that sticker on his rifle. Michael Waddell is rich and famous not just due to his snappy one-liners, but also because he's an uncanny big buck hunter who thrives under pressure&apos;¦usually. Then there was the time a 150-inch 8-point he'd been hunting for days finally swaggered directly to his tree and turned broadside at six paces. With the cameras rolling and the hunt on the line, Michael released his arrow and missed the entire animal. The Lesson: "Aim," said Waddell. Just because an animal is spit-swapping close doesn't mean you can point and fire. And just because the Bone Collector misses a buck on camera at six yards doesn't mean you can laugh at him. Well&apos;¦yes, it does. Big bucks are sneaky. Always hang your bow in front of you and practice shooting from different angles. 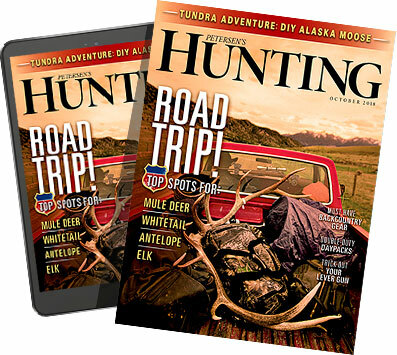 Mike Carney is the executive vice president of the company that publishes this magazine and a serious whitetail hunter. One day, he was perched on a steep hillside in his Illinois woods, overlooking a well-worn trail. He was hunting a 170-plus-inch buck he'd seen earlier in the season. Now it stood mere feet behind him, but there was nothing he could do. Instead of walking up the trail as Carney had prepared for, the bruiser busted through the wall of brush behind him. Carney couldn't rotate, stand, or even reach for his bow as it hung on the tree's trunk near his left shoulder. Meanwhile, sensing something was up, the big buck froze. After four minutes of pure agony for the quivering hunter, the buck turned and walked away. Carney nearly cried. The Lesson: Bucks don't get big by blundering down doe trails. They're sneaky. So always anticipate the unanticipated. Hang your bow near your bow hand in front of you so you can reach it with one subtle hand movement. Practice shooting your rifle or bow from sitting positions and weird angles. This is one of the best remedies for runaway bucks. Darren LaSorte is the NRA's former hunting policy manager. He's also a guy who deems himself naturally unlucky and laments that he's never killed a B&C whitetail despite vigorous effort. But last year, during the muzzleloader season, his luck almost turned. Almost. In an act he later called "selfless," he decided to exit his stand at noon because his hunting buddy needed some help cooking breakfast. Just then, however, a fat doe appeared. Figuring he could serve his hungry girlfriend and the landowner in one aim of his CVA, he fired. Then the doe did the only thing that LaSorte says could have caused the following blunder: It died directly in front of him. Knowing it was dead and considering he was about to climb down from his stand, LaSorte saw little reason to reload before lowering his rifle to the ground. And you know what happened next. "This @#&! Booner buck runs right past me," said LaSorte. "I pulled my rifle back up but couldn't reload it in time." And now no amount of time can ease his pain. The Lesson: Always keep your gun or bow loaded and ready during legal hunting times, no matter how improbable you'll use it. This includes walking to and from your truck and outhouse. Darren should have reloaded his rifle immediately, then simply removed the primer when lowering it. Or he could have refrained from shooting the doe from his best stand in the first place.